Armory, 711 N. Pennsylvania Street in Indianapolis, IN 46204. "Super Brawl" fight night, headlined by the battle between Jones (12-1) and Sanchez (7-11-1), is set for Saturday, February 16 in the FITE.TV PPV® event. The live broadcast kicks off at 7:30pm ET/5:30pm PT with an explosive undercard leading up to the co-main event featuring rising star flyweight Saleto "Mr. Personal" Henderson. "Indiana's Malcolm "Unmerciful" Jones just came off a win against Australia's Les Sherrington in December," said Dominic Brogan, founder of Chin Chek Promotions, the only consistent pro boxing game in Indianapolis. "It was a cold knockout performance and I predict Jones will take out Emmanuel Sanchez in this Super Brawl." Jones is currently ranked #18 in the nation as a professional and 6-time Golden Glove Champion. The experiences of Head Trainer Kenny Walker and Coach Ali Khalif give Jones the foundation to take the journey to the top of his division. "I have known Malcolm since he was a teenager and he is like a son to me," said Walker. "Malcolm has always been focused and dedicated to this sport. Together, we are on the road to a world championship." Walker, a native of Gary, Indiana, trained Franklin Lawrence. Under the guidance of Walker, Lawrence was ranked #3 in the nation as a professional fighter. "I've worked with and trained multiple Indiana Golden Glove champions." Walker says, the fight on February 16th is just another step on the road to a world title. Malcolm will be facing a tough opponent. "Malcolm is stronger, looking very sharp, and his mental focus is second to none," Walker said. "With this fight against Sanchez, we are going to show fight fans why we changed his ring name from "KO" to "Unmerciful". Ali has been a part of the USA Boxing Inc. for more than 15 years and has trained fighters all over the country. He has trained one world champion who is now on the U.S. Olympic National Team and worked in the corners of greats such as World Champions Mike Tyson and Roy Jones, Jr.
Ali started training Jones in 2011 while he was still an amateur boxer. "Malcolm developed a smart style of boxing and his nature is to seek and destroy," said Ali. "Head and body shots will be the key to my success in this next fight," said Jones. he wore into the ring. The Puerto Rican-American former boxer has fought in the Junior Welterweight, Lightweight and Junior Lightweight divisions. "I prefer the nickname "Acts 2:38," said Manfredy who converted to Christianity. The Crown Point resident retired in 2004 with a record of 43-8 with 32 KOs. The "Super Brawl" event ring announcer is B Swift, Indy's radio personality from Hot 96.3. Boxing Champion Angel "El Diablo" Manfredy who will be inducted into the 2nd Annual Indiana Boxing Hall of Fame. Meet Manfredy on Feb. 15 for the weigh-in and Feb. 16 for fight night at the Tyndall Armory. 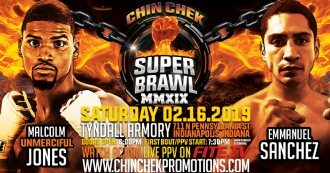 Dominic Brogan is the founder of Chin Chek Promotions, the only consistent pro boxing game in Indianapolis. Catch all the action live at the Tyndall Armory or the live stream on FITE.TV on February 16. Friday, Feb. 15 Noon OFFICIAL WEIGH IN: OPEN TO THE PUBLIC (Free)!